Gary discovered his love of music around age 13 and pestered his parents for a guitar, finally getting one when he was 15. They did not consider music a viable profession and were sure he would outgrow his interest. He taught himself how to play and found out about a free music school in the area (CeMA SiNEM Coto Brus) which offered instruction in orchestral instruments. The only instrument they had available for him was a double bass, also called an upright bass, a contrabass, a bull fiddle, or a dog house bass (that would be the blues guys). Although he knew nothing about that unwieldy and difficult instrument, he was determined to play something, and after a bit he fell in love with its sound and function. He practiced constantly, even though his family could not support him financially or even encourage his choice. 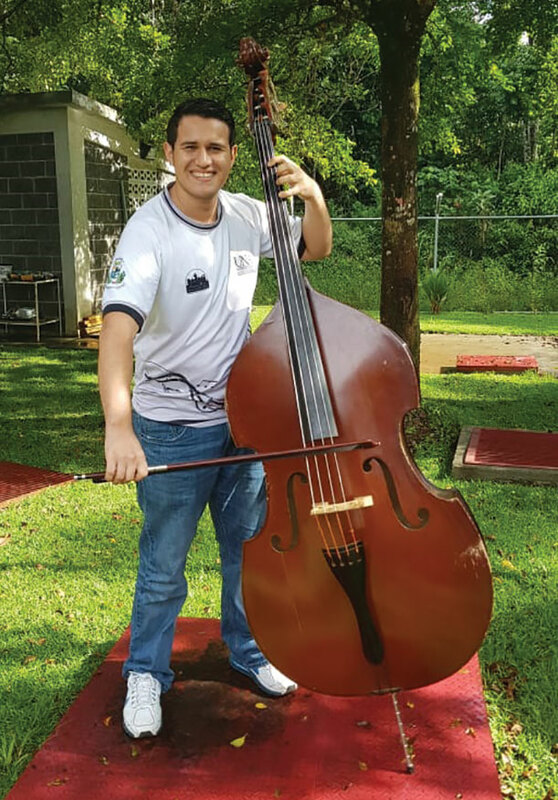 His dedicated practice, research, and struggles to study music paid off when he was selected to be part of Julio Fonseca’s National Youth Orchestra in 2015. 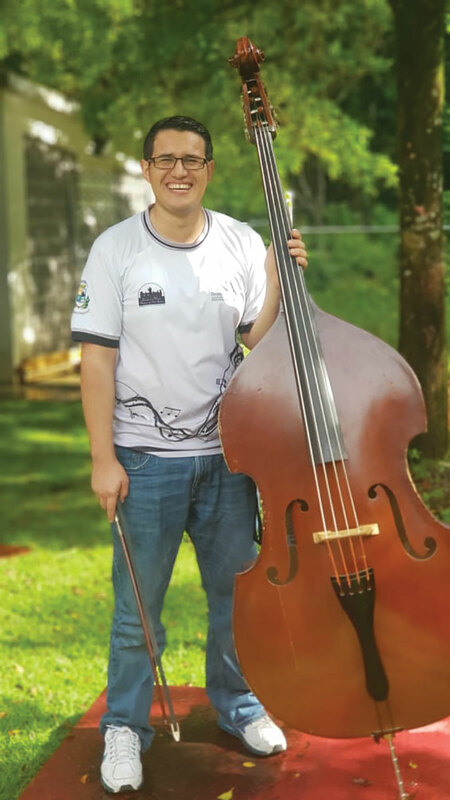 A big turning point was when he was heard by Danilo Castro, a GREAT classical and jazz bassist and professor of music at the school where I teach violin, the Escuela de Music Sinfonica de Perez Zeledon. 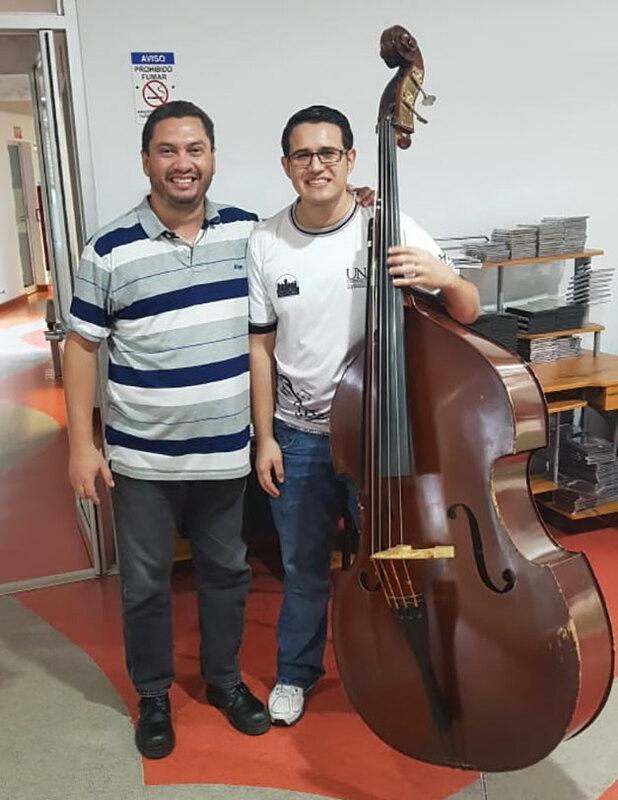 Danilo became Gary’s mentor and first real bass teacher, and helped set up an instruction schedule for him about the many aspects of music. Most of our teachers make the commute from San Jose to San Isidro and often have to spend the night, so the school keeps a small, bare-bones apartment for their use. As a measure of their respect for his efforts and monetary situation, the board of directors and professors voted to allow Gary to live in the apartment free of charge while studying at our school. Unprecedented and wonderful support for a student. The bass is an expensive instrument—Gary does not yet own one—and it is the largest and lowest pitched bowed string instrument in the modern symphony orchestra. All the other stringed instruments are tuned in 5ths, but it is tuned in 4ths (the amount of notes in the interval between strings). The finest of these instruments are probably made by European luthiers and cost thousands of dollars, and they would likely be made out of maple, spruce and ebony. Student instruments or ones that might be resistant to not only humidity but the abuse they might get being played in bars or being on the road are often made out of plywood. While being a regular member of the orchestra, it is also used in a variety of other genres, such as jazz, blues, rock and roll, country, bluegrass and tango music. It’s either played with a bow or by plucking the strings (pizzicato). It’s about 6 feet tall from the endpin to the scroll on the top, so it is played while standing upright or sitting on a high stool. Despite the size, it is not as loud as many other instruments, due to its low range, and in a large orchestra 4 to 8 bassists may be playing the same part in unison to produce enough volume. 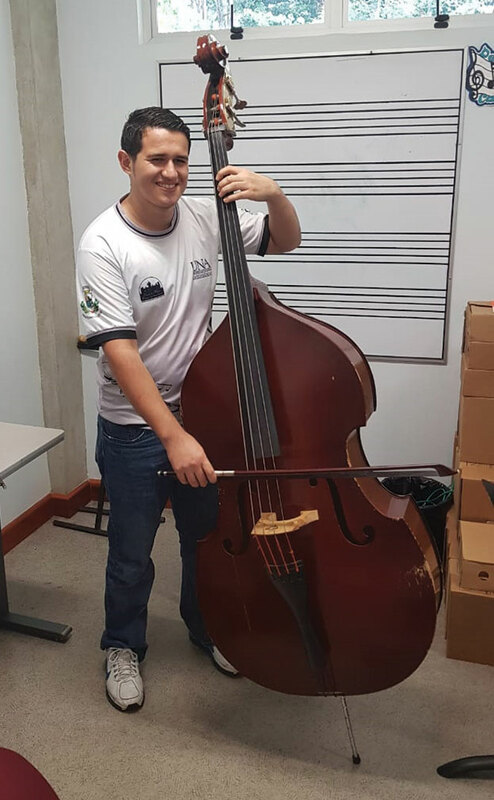 After attending a prestigious music camp in the states, completing his studies at the music school in San Isidro, perfecting his English, and absorbing everything he could about music and in particular about the bass, Gary was scheduled to audition for a university in Ephraim, Utah. Nothing has been easy for this kid—he broke his foot and was not as prepared as he had hoped to be, but he clearly impressed the panel of judges and was awarded a $10,000 scholarship to Snow College, where he will be working towards a Bachelor of Arts degree in music, with emphasis on commercial adaptations. This is a fairly small college, but has a very well respected music department and he will graduate with great credibility and probably some good job options. He has to come up with a matching $10,000 by January of 2019, and our school is having bake sales and concerts and trying to help him raise the funds he needs. So far he has raised $1,200—colon by colon and empanada by empanada. So—I am asking my readers out there to help make this fine young man’s dream a reality. Shoot, you almost never have to pay a cover charge to hear us play, so send him 10 bucks and ‘pay it forward’. Send him $5 instead of buying another Imperial. If you can afford it, invest in the future of music in this country and all over the planet by investing in HIM. You might see him playing Carnegie Hall one of these days and you can brag about helping to put him there. I have taught for 8 years or so at the music school in San Isidro, and have been mightily impressed by the dedication and high quality of the teachers, by the administrative flexibility and heart they’ve shown and by the unselfish pride everyone has of the accomplishments made by these kids. 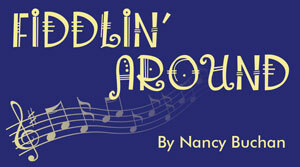 Musical greatness happens there folks, so be part of it. Here’s how to help Gary. Deposit directly into his Banco de Costa Rica account. and gifted musician she is.